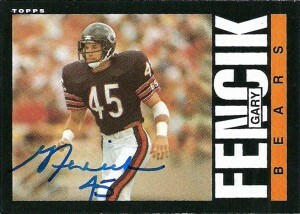 A 10th round draft choice out of Yale- by the Miami Dolphins in 1976, nobody really gave Gary Fencik a chance to make the team roster; However by the time he retired after the 1987 season, he was the Chicago Bears All-Time leader in career interceptions (38) and tackles. Gary didn’t even make it out of camp before he was cut, and the Bears snatched him up where he appeared in 13 games his rookie season. In 1977 Fencik, earned the starting job at Strong Safety and held the position for the next 5 seasons, before he shifted over to Free Safety. Gary earned AP honors in 1981 with 6 interceptions for 121 yards and a touchdown, and a Pro Bowl nomination for his efforts both in 1980 and 81. With the shift to Free Safety in 1983, Gary saw his time increase as an enforcer closer to the line of scrimmage in defensive coordinator Buddy Ryan‘s scheme. 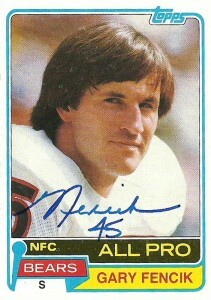 Although Fencik had a super 1984 season with 5 interceptions, a sack, and a fumble recovery, he didn’t find himself earning anymore accolades, but in 1985 contributed to the Bears 15-1 Super Bowl winning season, playing in one of history’s greatest defenses and participating in the Super Bowl Shuffle. Retirement came after the ’87 season, which came on his own terms. Gary has been in the in the financial industry since 1995. He’s also spent time as a color and in studio commentator for WGN and CBS.